﻿ Approach to the environment | Company Introduction | TAIYO KIKAI LTD.
Taiyo Kikai LTD. promotes the work activity which points the harmony social economic activity and global environment. 1. We always acknowledge the environmental effect regarding our activity and products and services and promote the protection of environmental pollution and plan to improve the environmental management system continuously. And, we keep the environmental law and other requirements which we agrees on. 2. We tackle the following points as the important points in the environmental aspect regarding our activity and products, services. １) The propulsion of saving energy and saving resources. ３) The propulsion of manufacturing our products points the environment and safety. 3. 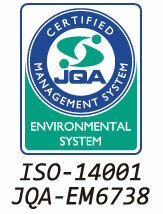 We promote the environmental management and set the purpose in order to accomplish this environmental policy. 4. This environmental policy is known to all employees including the affiliate company and we ask the cooperating company to understand this policy. And, this policy are open to people.